I shall only be referencing the 1995 animated film and the 2017 live-action film, to include the anime television series, the manga, or the various sequels will lead to an essay, rather than a review. 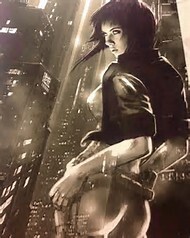 Scarlett Johansen stars in the 2017 live-action adaptation of the 1995 anime film ‘Ghost in the Shell’. The Key Word in that sentence is ‘adaptation’, a word that’s thrown around very frequently in this day and age where Hollywood is less inclined to take risks and try new things rather than hashing out remakes and reboots. Don’t get me wrong though, I am very pleased I went to see this film and I’m delighted with it for a number of reasons which I will get to in a moment. However I’m aware that there are many viewers who will walk away from this film disappointed, and to you, hypothetical sir or madam, I say: for goodness sake, be happy. The most common complaint I’ve heard from other fans of the original 1995 anime are the differences it has from the source material (I reiterate, ‘adaptation’), and I can understand why that would be a little upsetting, but I have some news for the die-hard fans; this film isn’t for us. I’m sorry, but it’s the truth. Try to understand: the producers are of course hoping to cash in on the nostalgia factor from people like me who love the franchise, in fact they’re practically assured of it, but this movie wasn’t made with us in mind, I would argue that no cross media-platform is ever made with the existing fanbase in mind. This film was made for everyone else, all the people who haven’t seen the 1995 film before. How many other people went to see ‘The Avengers’ despite never having read the comics? Are there going to be differences? Of course! If nothing new was brought to the table then I would’ve thought there’d be no point in seeing it. Game of Thrones, one of the biggest television series on right now, is an adaptation of a book series, and there are a landslide of divergences from the source material. Do you hear people complaining? No. You know why? It has to do with the spirit. The television adaptation of Game of Thrones is made in the exact same spirit as George ‘The Reaper’ R. R. Martin’s ‘A Song of Ice and Fire’ and both are completely recognisable as each other. It’s the exact same in Ghost in the Shell. The spirit, dare I say ‘the ghost’, of the 1995 anime film is a very real presence in the 2017 adaptation. Of course, this being an anime adaptation for an audience of ‘non-anime’ fans, there is a level of complication and fear that the anime community has got to be pretty used to by now. We’ve seen Justin Chatwin as Goku in ‘Dragon Ball: Evolution’. We’ve seen M. Night Shyamalan’s ‘The Last Airbender’. The Fear is real. I cite the recent live-action adaptation of Death Note that’s been announced recently as a continuation of this trend. The Writers were taking it seriously. The Director was taking it seriously. And as a result: I took it seriously. Yes. This is Ghost in the Shell. Minor spoilers for the opening scene incoming. I haven’t been pleasantly surprised in a while, but I was when I found that the opening scene in the adaptation is practically, shot-for-shot, identical to the original. The Major’s ‘birth’, as it were, is a breath-taking scene that brings all the elements of the anime and gives new life to them. It was wonderful to see, as are all of the scenes that pay homage to original. The character of Batou, The Major’s second in command, is my favourite example. The 1995 film doesn’t explain why he possesses cybernetic eyes except for the fact that humans are capable of having them within this world. Batou either had them installed because he wanted them, or they were installed for him as part of his training for Section 9. Well now, we can actually see how and why he had to get them, which a pleasure to watch. I was also delighted to see that The Major’s origin was looked at in the adaptation, even creating a character out of her mother, very (very) interesting from a viewer’s perspective. 1) she’s a cyborg 2) anime-Kusanagi was just as doll-like. It was a very good decision to cast her as the Major, and I was wrong to doubt her suitability to the role. (Trivia note: It was shot in New Zealand). If you have even a passing interest in this franchise then you have my recommendation to start with this film. It’s a fantastic rendition that will serve as a good introduction to the Ghost in the Shell world. George will start his final year studying English at Lincoln University and is writing his first novel.